Pandiscordian Necrogenesis are a solo project from San Francisco, California that has had an album reviewed before in this zine and on this recording plays a very raw and improvised form of black metal and this is a review of his 2018 album "Outer Supernal" which will be released on October 26th by Gilead Media. An ambient noise orientated intro starts off the album before going into a very fast and raw musical direction which also uses a great amount of tremolo picking and blast beats while the vocals are mostly high pitched black metal screams and the songs also bring in a great mixture of slow, mid paced and fast parts. All of the music is done in an improvised style while one of the tracks is very long and epic in length along with the riffs also bringing in a small amount of melody into certain sections of the recording as well as the music also adding in a lot of old school black metal influences and as the album progresses a couple of ambient instrumentals are added onto the recording and some of the later riffs also show an influence of thrash. 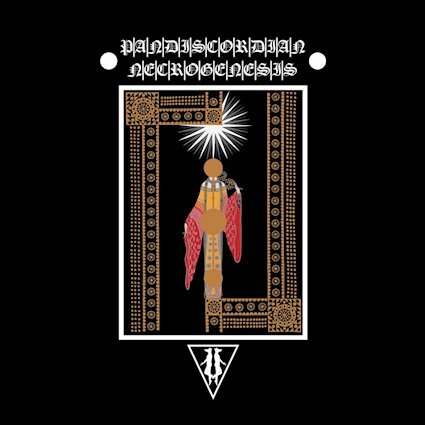 On this recording Pandiscordian Necrogeneses remains true to the raw and improvised style of black metal from previous releases, the production sounds very dark and raw while the lyrics have a concept revolving around Supernal's and Ascension's. In my opinion this is another great sounding recording from Pandiscrodian Necrogenesis and if you are a fan of raw and improvised black metal, you should check out this album. RECOMMENDED TRACKS INCLUDE "Outer Supernal" "Hidden Supernal" and "Depth Ascension". 8 out of 10.